Drew the Mighty Lion with Jasmine Hill, Development and Title III Program Manager, at Giving Tuesday event. CDU enjoys significant community support. 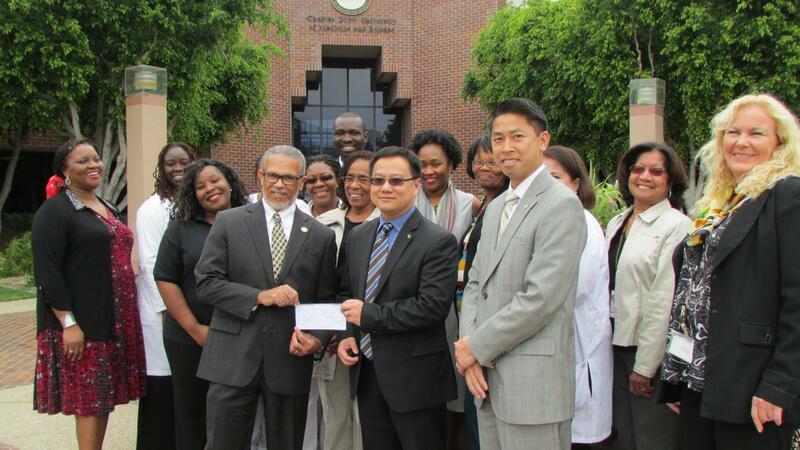 Founded out of the ashes of the Watts Riots, Charles R. Drew University of Medicine and Science is a vital South Los Angeles institution working to eliminate health disparities and providing unique, quality education and training opportunities. We continue to evolve and grow in stride, continually shaped by the needs of the community we serve. Throughout the years, community visionaries have donated time, insight, and financial resources to build our University. As a result, we’ve become a recognized leader in education, community-based research, and care. 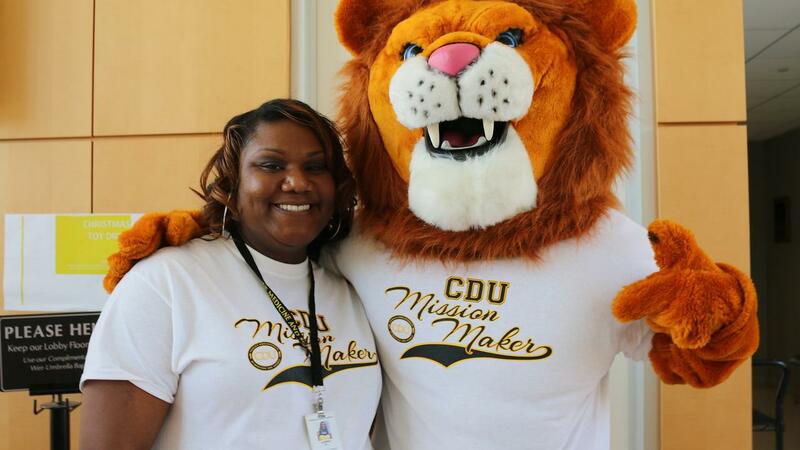 A vast majority of CDU graduates dedicate themselves to life-long careers working in underserved communities. Gifts to the General Fund allow the University to distribute resources wherever there is the most need. Your gift may be used for costs related to research, student aid, facilities and more. Mission Makers are friends and supporters of CDU who believe in our mission and have made a contribution to ensure our success. As a Mission Maker, you too can help CDU to continue to produce well-trained healthcare providers who will serve those in need. Help lay the foundation for health professionals and purchase a brick on the University campus that will be there for years to come. For medical students in honor of Dr. Ezra Davidson. Funds raised from this campaign will be matched by Dr. Fred Parrot and the Real Men Cook Foundation. In memory of M. Alfred Haynes, the president emeritus CDU, this scholarship is awarded to students who demonstrate both academic excellence and financial need. To honor the memory and contributions of Mrs. Lillian Harkless Mobley, this endowment awards scholarships to CDU students who come from the very communities that Mrs. Mobley fought so hard to improve. 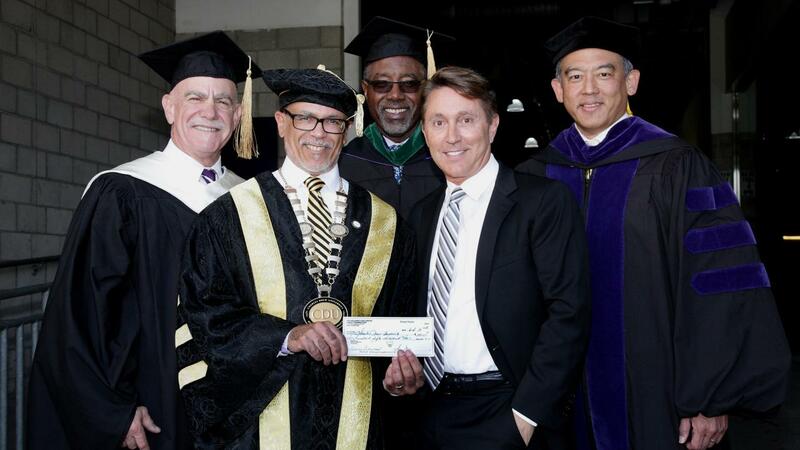 The Albert Jerome Saunders, Sr., College of Science and Health Alumni Scholarship. Mervyn M. Dymally School of Nursing-Sallie Tucker Allen Cultural Diversity Endowed Chair. Help fund pioneering research towards a promising cancer treatments and therapies. Contribute to the many community-based HIV/AIDS research and outreach projects at CDU. Improve health and wellness in minority and medically underserved populations by supporting research. Help foster collaborative solutions for improving minority health and reducing ethnic and geographic disparities in cardiovascular and related diseases. Saturday Science Academy exposes Pre-K through 12th grade students to fun and engaging science material in an effort to motivate them to move into health care fields after graduating high school. President Scholars are seniors with the highest scholastic aptitude who participate in a yearlong Program at CDU. Students accepted into this program have access to attend CDU lectures and are eligible to receive a scholarship to attend Charles R. Drew University of Medicine and Science. A 10-week summer health science immersion program that exposes and engages underrepresented 11th and 12th grade students to clinical research. This program encourages students to enter the health care field and is aimed towards eliminating disparities in Science, Technology, Engineering and Mathematics curriculum.